Classic sitcom. Sergeant Wilson is to be appointed manager of the Eastgate branch of the bank and made a lieutenant in the Eastgate Home Guard to fill a vacancy. Browse content similar to A Wilson (Manager?). Check below for episodes and series from the same categories and more! -Two, both marked "Delayed By Enemy Action". Do you realise that we haven't had any letters from head office for over two weeks? Goodness knows how many documents have been lost! -Shall I set up the Lewis Gun? -Where IS he? It's 9:15. A Nazi paratrooper may have landed in the night and captured him going to work. I'd better do it myself. Hello, Swallow Bank. No, I'm not the manager. Hang on, please. It's for you, Mr Mainwaring. Long distance. It's head office. You see to the gun. It's West from head office. Oh, yes... Stop fiddling with that gun! I'm ringing because some of our letters may have been destroyed. Put that gun down! Put it down, I say! -I thought the bank was being robbed. No, everything's under complete control here. I won't waste time - this call is expensive. so you'll have to manage the best you can. I said I shan't be able to replace Wilson for several weeks. Why? Where is he going? You know as well as I do that he's taking over as manager of our Eastgate branch. I wrote to you about it last month. I never got the letter. It must have been destroyed in an air-raid. You'll just have to cope. There's a war on. Keep in touch. Goodbye. -Wilson's been made the manager of the Eastgate branch! Oh, I know that! Mum's ever so pleased. I wanted to tell you Sergeant Wilson's commission has come through. Captain Square wants him with the Eastgate platoon as soon as possible. I expect you'll miss him. -Who will you promote in his place? I must say, Sergeant Wilson deserves his promotion. He's a good chap. What are YOU going to tell me about Wilson?! That he's been made Archbishop of Canterbury?! I'm sorry, Vicar. I'm not myself this morning. Oh dear, aren't you? I'm afraid I have rather a confession to make. I don't mean THAT sort of confession. That's mostly for the RC. on Tuesday next is, er, tonight. Would you mind cancelling your parade, otherwise I'll look a fool? Oh, how sweet of you! You DO look red. Shall I open the other window? I've just had a bit of a shock, that's all. -I've never seen you look like this before. -Go and tell the platoon that tonight's parade is off. -Then get these orders typed up and duplicated and take a copy to each member of the platoon. -Get on with your work. Actually it's, er...20 to 10. -I've been doing some shopping. I bought this. Do you like it? It's for officers only, of course. I bought these. I'm not sure whether I like the cloth or the brass ones. But I understand you shouldn't wear brass with battle dress. -I'm awfully sorry but I don't quite follow you. Yes, you do! You're waiting to step into my shoes! -You didn't tell me about the Eastgate job. -I thought you knew. Head office must have written to you. Captain Square probably overstepped the mark but he's keen to have me. He said he was most impressed with what I've done with the platoon. With what YOU'VE done with the platoon?! Yes. He's had his eye on me for some time now, you know. Just because you went to some tuppenny ha'penny public school! I wouldn't call Meadow Bridge THAT. Meadow Bridge(!) You know where I went, don't you? Eastbourne Grammar! I had to fight to get there and fight even harder to stay. It's all to your credit. You never fought for anything in your life - father in the City. You let everything come to you. It wasn't as simple as all that. I've been the manager of this branch for over ten years now. I ought to have gone on to better things years ago! But at interviews, they ask the same thing - "What school did you go to?" And as soon as I tell them, that was that! I'm sure that didn't influence them. If they ask you, you say, "I was at Meadow Bridge - small but rather good." There were over 300 boys there. AND I've taken a lot of shopkeepers and made them into a crack platoon! I'll show you how I value YOUR help as a sergeant AND a chief clerk! Get me 2-5-2, will you? Hello, Jones? Get round to the bank immediately. Until you're relieved by head office, you will be chief clerk. -You are now chief clerk. Do you think I've got the brains for it? I'm sure if Wilson has, YOU have! -I don't talk posh like Mr Wilson. -Never judge a book by its cover. Mr Mainwaring, Mr Wilson, Pikey... I can't stay, the offal's arrived. There's a long queue and Raymond is looking after the shop. -This won't take a minute. Go away, Pike. Now, listen carefully to what I'm going to say. Corporal Jones, I hereby promote you to sergeant. Do you think that's wise, sir? and say in that supercilious voice, "Do you think that's wise, sir?" Well? What do you think of that, Jones? Jones? Oh, Mr Mainwaring, I don't know what to say. This is extraordinary - promoted as sergeant! I never believed it would come true. After all these years, I can stand in front of those brave boys with three stripes on every arm. Not just one, not two, but... but three. You see the sort of man I'm promoting - brave, true and loyal! There's just one thing. We can't have TWO sergeants. I'll miss you, Mr Wilson. Nobody deserves promotion more than you. I shall try to live up to the high ideals and the standards of loyalty you put up us. -Could you put the promotion down officially? Write it down so I'll have something solid to show to people. -..to the rank of sergeant in the Walmington-On-Sea Home Guard. -I'll have this typed out and then put the name on. -Thank you, sir. I'll get back to the shop. -No need to do that, thank you very much. -I'll get back to the shop now. Can you come at once? Miss King's got a query of a customer. -and tell them tonight's parade is off. "This is to confirm that you've been promoted to the rank of sergeant..."
Why has he promoted everybody else to sergeant and not me? Ah well, at least I AM chief clerk. I wish Mr Mainwaring wouldn't use my drawers! KNOCK ON DOOR Come in! Is Mr Mainwaring in? He hasn't arrived yet. Mrs Pike, whatever is the matter? Nothing, but I did want to see Mr Mainwaring. It's Arthur, he's deceived me. I beg your pardon? He's been made manager of the bank in Eastgate. I thought he'd commute by train. and he's going to live there, and I shall never see him again! Of course you will - Eastgate is only ten miles away. It might as well be 100 miles away! "I've longed to take you in my arms and tell you how much I've missed you." Please, sir. What is it, Verger? I, er... Sorry, Vicar! What are you sorry about? I, er... What do you want? This is personal. I can SEE that. Just state your business! I can't move the harmonium alone. I only want it moving a few feet. I still can't manage it alone. Get one of the platoon to help you. I never thought I'd see His Reverence become a victim of wartime immorality! Don't worry, Mrs Pike, everything will turn out all right. Can't you do something about Arthur? He's changed so much. Ambition has turned his head. Very sloppy, very sloppy indeed. Now listen to me. There's going to be some changes around here! I'M in charge now. You can have it the easy way or the HARD way. Now, let's have a look at ye. You're as peelie-wally as a rotten banana. Ah, Godfrey! Pull your socks up or you'll be out on your ear. I'm not carrying any passengers in MY platoon. Aha, I'm watching you, Walker. Just put one foot wrong and I'll have ye! I'll take that stripe away. Now, buck up your ideas, all of ye! And remember, my name is Sergeant Frazer! THAT'S not how you spell it. Will you help me with the harmonium? Not me! It's got to be shifted. I'll tell the others what you've just said. All right, where is it? In the bell-tower. Come on. Take your jacket off. It's hot work. Right, now that I've been made up to sergeant, I don't want you to worry that I'm too regimental. I'll overlook it if they bought the polish from me. Excuse me, Mr Walker! Will you help me shift the harmonium? Now that I'm a sergeant, I shouldn't do that sort of thing. Better take this jacket off. I might get my new stripes dirty in that bell-tower. 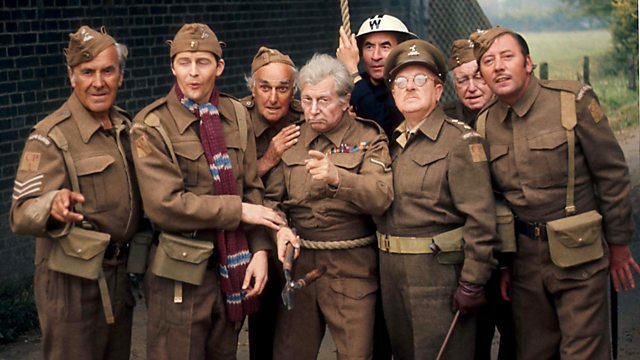 I can't understand why Captain Mainwaring promoted me to sergeant. I'll do my best to carry out the duties. I'm sure you will. Excuse me, I must wash my hands. Have you seen Mr Godfrey? He's in there. I want his first-aid kit. I need to put a bandage on this finger. That was a job well done. It must be a mistake. You can't have TWO sergeants. You should speak to Mr Wilson. I'm having nothing more to do with it. I wash my hands of the affair. I've fallen the private in. What shall I do with the sergeants? Well, I'm just off, sir. I thought I'd get the 9:30 to Eastgate. Why are you going now? It's only Wednesday. You don't start till Monday. The manager there has been called up. Mr West from head office will stay on in Eastgate to show me the ropes. Mr West of head office, eh? We ARE honoured. Why are you travelling in uniform? -Well, it's just sort of...handy. -You want to parade about looking for salutes! -The day you got your new uniform, I followed you. You went along the high street waiting for a soldier to salute you. In the end, you had to make do with a sea-scout! That's enough! Say what you have to say and go. Will you come and see me off? Certainly not! Our relationship ends now. After all we've been through, can't we let bygones be bygones? Don't try to soft-soap ME. At least my salutes are done properly. Your salute was rotten! -You've done very well, Wilson. -We've thought of promoting you for some years. -If it wasn't for Mainwaring, we would have. -He said, in his opinion, you didn't show enough initiative. -I think you'll make an excellent manager. I must get back to London. -Being Saturday, I expect you're busy with the Home Guard. On Monday morning, YOU will be sitting in that chair. At 9am, you will take your place at that desk - as manager! < Good morning, what a lovely day! I'll see you in a moment. I have some important items for you. All in good time. I'd rather like to have a word with the staff first. Mr Wilson would like a word with you. Will you all come in? I thought it might be nice to have a chat to get to know each other. Come along, quick as you can. Right. Now, are we all here? I thought it might be a nice idea to meet you and have a word together. that I like to work in a nice, quiet, relaxed kind of atmosphere. If you have any worries, don't be upset at all. I want it to give you a feeling of security and confidence. I shall always be here to see you. All right? There are the sirens, Mr Wilson. We'd better go down to the shelter. It's perfectly all right. We can look at those papers in the shelter. Come along, my dear. What a pretty blouse you're wearing! It's lovely. -I hope Uncle Arthur's OK.
-He'll be OK, the devil looks after his own. After all, they haven't had one single bomb on Eastgate yet. This is very upsetting, sir. -How will you carry on? We won't. We'll close the Eastgate branch and take the business over to Hastings. Must be the shortest appointment in history. and at five past, he had no bank to manage. How is he taking it? You can never tell with Wilson. He doesn't show much emotion. Yes. We must all carry on doing our bit, Mainwaring. Yes, certainly, we must, sir. -I've just had head office on the phone. They're very sorry. -May I say how sorry I am, too? -Don't sit down, I'm rather busy. I've had a word with GHQ. They will allow you to keep your rank. Get them sewn on by tonight. Classic sitcom. After a promotion, Wilson moves to Eastgate to be manager of their bank and joins their Home Guard at the rank of First Liuetenant. His new life does not last long, however, as the bank is bombed the day he arrives.